Make a sports fan's day. Choose his or her favorite NFL team, then give us a name. Finished print will be personalized in two places. 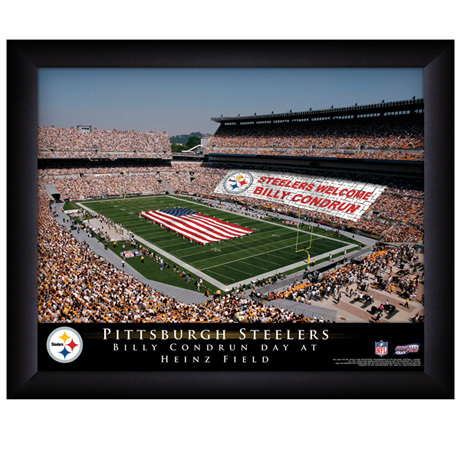 The crowd banner will say (for example) "Steelers Welcome Bob Smith" or "Steelers Welcome the Smith Family," and the words below the photo will say "Bob Smith Day (or Smith Family Day) at Heinz Field." Framed in black wood under acrylic (16" x 11"). Specify team/university name; specify fan/family name up to 30 characters including spaces. Allow 3 weeks. No rush delivery or gift box. Item can only be shipped within the Continental US.